Since Rose Levy Beranbaum has kindly gifted us hungry Jewish chefs with the perfect honey cake for the new year, we need only to consider Rosh Hashana’s sister dessert, Apple Cake (or, frankly, anything apple for a sweet finish to the festive meal). The classic holiday cake receives traditional treatment in British chef Denise Phillips’s new book, The Gourmet Jewish Cookbook (Thomas Dunne Books). Her Apple and Cinnamon Dessert Cake is relatively easy to make and quite moist, dotted with raisins and, if you so desire, dusted with vanilla sugar and decorated with thin strips of lemon zest. The rest of Phillips’s recipe collection features similar, time-tested Jewish fare (borscht, brisket, kugel) but with some welcome ethnic twists: Jamaican Lime Chicken, Crispy Shredded Chilli Beef, Lychee Sorbet—you get the idea. Cooks with special dietary requirements will welcome Phillips’s “Free From” chapter, focusing on dishes for vegetarians, diabetics and those with gluten intolerance. For the upcoming Sukkot festival, try her Date and Walnut Bread, which is vegetarian and pareve, and Roasted Root Mash Pie, a mix of seasonal root veggies like sweet potatoes and turnips mashed and then topped with low-fat cheese (this one is diabetic friendly, gluten free and vegetarian). 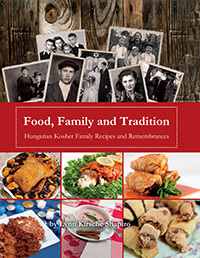 For uber-classic Hungarian Jewish cooking, consult the recently released Food, Family and Tradition (The Cherry Press) by Lynne Kirsche Shapiro. She includes all the basics, from chicken soup to kreplach to blintzes, plus truly Hungarian specialties like Chocolate Yeast Roll (Kakaós). Her Sweet Lukshin Kugel is a simple, timeless version of what we all know and love about these sweet kugels (this one is pareve). For Rosh Hashana, Shapiro’s Baked Apples—a spiffed-up version of her mother’s original—provide an elegant and deceptively easy final course. The streusel topping and chopped pecans and raisins add texture, flavor and sweetness to an already aromatic dessert. As lovely as it is to look at, the Monday Morning Cooking Club’s second cookbook, The Feast Goes On , offers an entrée to cooking beyond the familiar limits of Jewish cuisine. While recipes are recognizable—brisket, poppy seed cake, latkes—their presentations are not. The elegance of dishes like Flommen Tsimmes Brisket, made with light molasses, prunes and potatoes and perfect for a Rosh Hashana table, exceed standard comparisons. 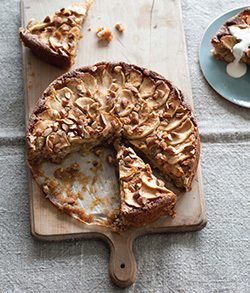 Two apple desserts stand out: Flourless Apple, Almond and Ginger Cake and Yolan’s Apple Pie. The cake is specifically touted for Passover, since ground nuts replace flour (so it’s gluten free too! ), but the apples and raisins, not to mention the seasonal favorite maple syrup, make this gorgeous dessert a strong candidate for the Rosh Hashana feast. If, as I do, you will try anything featuring ginger in the ingredients list, definitely make this cake. The apple pie is pretty straightforward, except for the first step of stewing the apples and the schmear of strawberry jam on the bottom half of the crust, enhancing the depth of the fruity flavor. While the recipe calls for homemade dough, feel free to substitute store-bought pie crust. 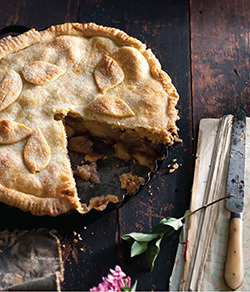 The recipe’s author, Merelyn Chalmers, remembers her mother serving the pie with cognac-laced whipped cream. In a nod to Rosh Hashana and an extension of the apple theme, use an apple brandy like calvados. Here’s to a sweet and tasty New Year. Shana Tova ve b’teyavon! 1. Preheat oven to 350. Grease and line a 9-inch springform pan or 8 individual ramekins with parchment paper. 2. Using and electric mixer whisk together the eggs, sugar, cinnamon and lemon zest until the mixture is thick and mousse-like—about 5 minutes. The whisk should leave a trail in the mixture. 3. Sift the flour, baking powder and salt over the egg mixture, then fold it in gently. 4. Slowly drizzle the melted butter or margarine from the side of the bowl and fold in gently with a metal spoon. Carefully stir in the apples and raisins. 5. Spoon the mixture into the prepared pan and level the surface. Bake for 40 minutes, or 20 minutes for the individual ramekins. 6. Allow to cool for 10 minutes before inverting on a wire rack. Turn the cake the right way up. 1. Preheat the oven to 375. Core apples leaving 1/2 an inch at the bottom; do not cut through. 2. In a small bowl, mix together sugar and cinnamon. If using pecans and raisins, mix with cinnamon-sugar. 3. Lightly spray an 8-inch-square glass baking dish with cooking spray. Spoon cinnamon-sugar, with pecans and raisins if using, equally among the hollowed apples. Cover with lightly sprayed foils. Bake one hour. 4. Is using streusel, bake until apples are almost cooked through, 45 minutes. Remove from oven. Uncover, spoon on any pan juices and sprinkle with 1 tablespoon streusel each. Return to oven and bake until apples are cooked through and streusel is golden, 15 to 20 minutes. Streusel (Makes about 1 cup): 2/3 cup flour, 1/3 cup sugar, 1/3 cup margarine; in a small bowl, mix together flour and sugar. Cut the margarine into small pieces and cut into the flour-sugar mixture until the texture of a coarse meal. 1. Preheat the oven to 350. Grease and line a 10-inch springform pan. 2. Peel and core the apples, then cut into wedges. 3. Over medium heat, melt the butter in a frying pan large enough to fit the apples in one layer. Add the apple wedges, superfine sugar and cloves and toss to combine. Cook, stirring occasionally, until the apples are well coated, soft and starting to color, about 5-10 minutes. There should be no liquid left in the pan. Remove the cloves, add the raisins and cook for another minute or so to soften. Remove from the heat and cool. 4. Process the ground almonds, whole almonds, ginger and baking powder in a food processor until coarsely chopped. Set aside. 5. In an electric mixer, whisk the eggs, raw sugar and maple syrup unit light and fluffy. Fold in the nut mixture and cooked apples. Pour into the prepared pan. 6. To make the topping, core and thinly slice apples and arrange over the cake batter, overlapping slightly. Scatter the almonds on top, pour the melted butter over and then sprinkle on the sugar. 7. Bake the cake for about 1 to 1 1/4 hours until golden and cooked through and a skewer inserted in the middle comes out clean. If the cake is browning to quickly, cover with some foil. 8. Cool completely in the pan and serve at room temperature with plain yogurt or vanilla ice cream. To make the stewed apples, peel and ore the apples and cut into thick slices. Melt the butter in a deep frying pan and add the sugar. Stir until melt and slightly browned. Add the apples to the butter mix and toss gently to combine. Place a lid on the pan, turn the heat to low and steam the apples for 10 minutes, or until tender. Remove the lid and add the cinnamon and vanilla. Continue to cook, uncovered, for a further 5 minutes, or until the liquid has reduced and the apples are almost dry. Do not over stir the apples, you don’t want them to break up too much. Set aside to cool. To make the pastry, place the flour in a bowl and grate the cold butter on top. Occasionally dip the butter into the flour to make it easier to grate. Rub the butter into the flour with your fingertips or a pastry cutter until it resembles coarse crumbs. Combine the egg yolk and cream, then pour onto the flour and mix by hand until a rough dough forms. Knead lightly on a lightly floured board, cover with plastic wrap anyplace in the fridge to rest for 1 hour. Preheat the oven to 350. Butter and flour a 9-inch pie dish. To assemble the pie, cut the pastry in half and reserve half for the top. On a lightly floured board, roll out the half to about an 1/8-inch thickness or large enough to fit the pie dish. Gently place the pastry into the prepared dish, leaving an overhang. To make the filling, mix the ground almonds with the sugar. Spread the pastry base with the strawberry jam and sprinkle half the almond mixture on top. Whisk the egg white until stiff and gently fold into the cooked apple. Spoon the apple mix into the pastry base and sprinkle the remaining almond mixture on top. Roll out the other half of the pastry and place on top of the filling. Cut a small hole in the middle with a sharp knife to allow steam to escape. Press the edges of the pastry (top and bottom) together to seal, then trim the pastry to fit the dish. Press around the edge with a fork to decorate. If you like, cut leaf shapes out of any leftover pastry and place them on top. Brush with the egg wash and sprinkle with the sugar. Bake for 45 minutes, or until golden. I’m on a fixed income and at this time cannot afford it. I lost all my beautiful cookbooks in Super Storm Sandy and I’m trying to replace them. If there is anything that can be done for me to receive your cookbook I would very much appreciate your help. Thank you in advance and have a wonderful, peaceful NEW YEAR. i would like to buy the cookbook and present it to Marjory for a Rosh Ha Shana gift. please advice me how it can be done. Marjory, please write me…and I will buy you this cook book..I hope you do not mind if it is a used one..dh.